Front of the recipe card for Peanut Brittle Cake. 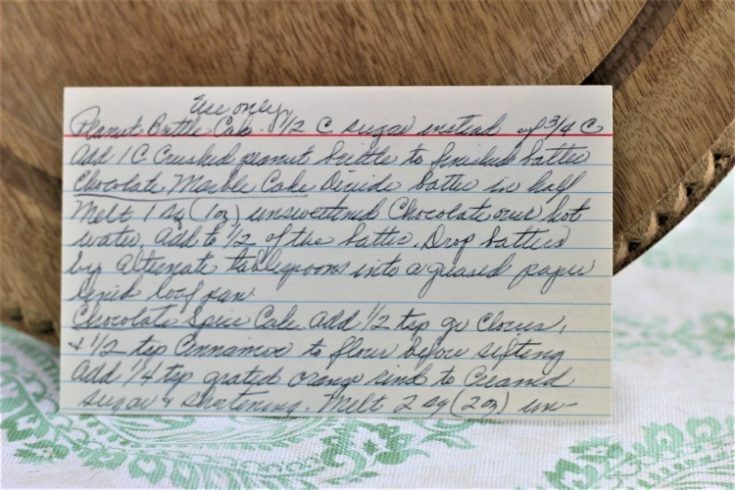 Back of the recipe card for Peanut Brittle Cake. 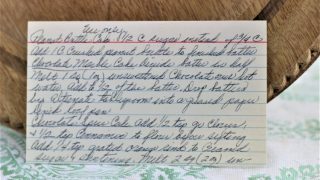 There are lots of fun recipes to read in the box this recipe for Peanut Brittle Cake was with. Use the links below to view other recipes similar to this Peanut Brittle Cake recipe. 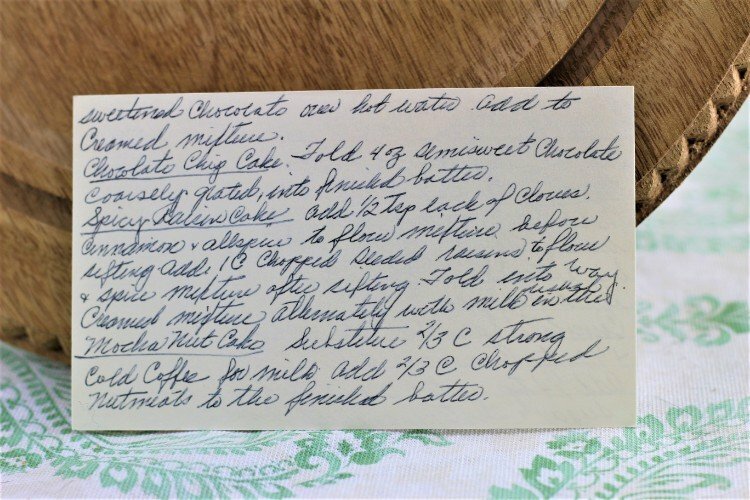 If you make this Peanut Brittle Cake recipe, please share your photos and comments below! Chocolate Marble Cake: Liquid batter in half. Melt 1 sq (1 oz) unsweetened Chocolate over hot water. Add to ½ of the abtter. Drop batters by alternate teaspoon into a greased paper [liquid] loaf pan. Chocolate Spice Cake: Add ½ tsp of cloves & ½ tsp cinnamon to flour before sifting. Add ¼ tsp grated orange rind to creamed sugar & shortening. Melt 2 sq (2 oz) unsweetened chocolate over hot water. Add to creamed mixture. Chocolate Chip Cake: Fold 4 oz. semi-sweet chocoalte coarsely grated, into finished batter. Spicy Raisin Cake: Add ½ tsp each of cloves, cinnamon & allspice to flour mixture before sifting. Add 1 cup chopped seeded raisins to flour & spice mixture after sifting. Fold into [way] creamed mixture alternately with milk ____. Mocha Nut Cake: Substitue 2/3 cup strong cold coffee for milk, add 2/3 cup chopped nuts to the finished batter. Use only ½ cup sugar instead of ¾ cup. Add 1 cup crushed peanut brittle to finished batter.